Not to be confused with swampy. 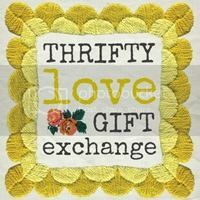 I participated in my first blog swap last year and it was so much fun. The lovely Danielle hosted it and it was an ornament & scarf swap. I am a huge fan of Danielle and I'm pretty sure we would be great friends if we lived close, seriously, she's awesome. Anyway, I recently joined another swap hosted by several ladies, including Danielle. This time it was a thrift swap! I do love thrifting so this was a no-brainer for me. I got paired up with Amy over at PluckingDaisies. She is super creative and so very talented. We exchanged emails and after getting to know her through those and digging through her blog, I set out to find some treasures I hoped she would love. Wouldn't you know, I got too excited about getting them shipped to her that I totally forgot to take pictures of my finds?! I'll will say that I got an encouraging email from her once her gifts arrived and I think I did my job in finding her some goodies. I ventured out to some local Goodwill stores, our Saturday flea market and some other little shops. I found a cute miniature tea set for her. See, when you check out her blog, you'll find that she makes the coolest Alice in Wonderland pieces so I had to get her the little set. I also found some super amazing deals at Goodwill on books. I found a Children's encylopedia and two vintage children's books for her to use as inspiration for her artwork or to use in her awesome little creations. Sorry about the lack of pictures, but I hope she'll share them today at her blog. Enough about what I found and on to what I got!! First off, I was totally amazed when I opened my package. Talk about happy mail! 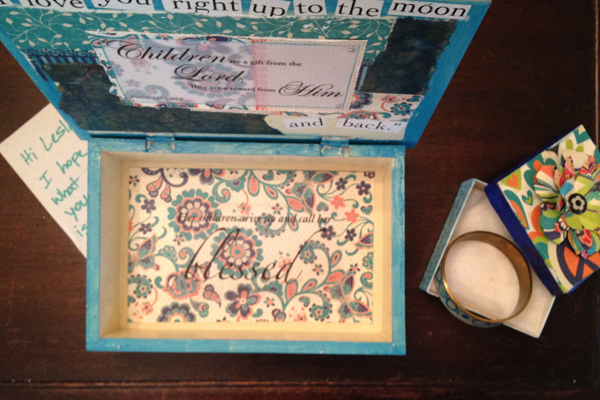 Not only did Amy take the time to shop for me, but she also created a totally unique keepsake box! 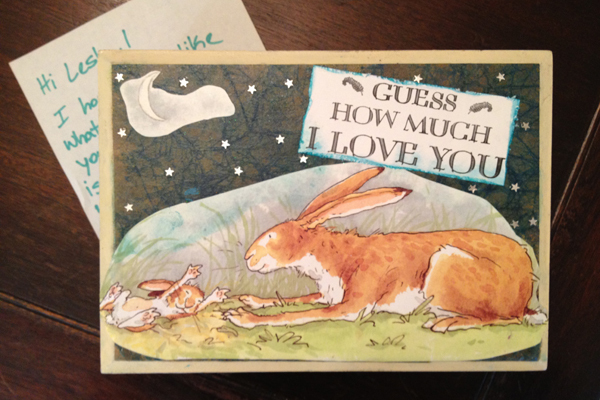 I don't think she knew how much I loved the book "Guess How Much I Love You" she used but it's one of our all time favorites around here. Check out her post on what went into this box here. It so great. I am a huge fan of the illustrations in the book and am so touched that she included some personal details in it as well. One of the verses she used was about children being gifts and the other is about being blessed as a mom. So incredibly awesome. She also found me a sweet teal bracelet and an awesome little baking dish. I'm telling you folks, this lady is fun stuff. So, that's a little about the latest swap I joined in but alas, I think I'm addicted because little miss Kim over at acuppakim is hosting her second mug swap and I totally signed up for that too. I think Wednesday's the last day to join so get over there and let her know you want to swap too. Why do I love these little internet swaps? So glad you asked! I really enjoy shopping for other people and trying to find the perfect gift. I love getting to know other people through the swap and checking out their blogs and what their all about. I like finding and making new friends in the land of the internets. I also love getting happy mail and surprises. So, thank you to Amy for my thrifty goodies. Thank you hannah, sarah, jami, stephanie, heather, esther, carina, and danielle. for hosting the thrift swap. Others are linking up at their blogs today to show off their loot too. 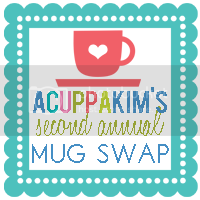 And thank you, Kim, for hosting the mug swap!! hooray for swapping and new friends! and super glad you'll be doing the mug one, awesome! Such a great book! This was so fun, Hannah!! Thanks. 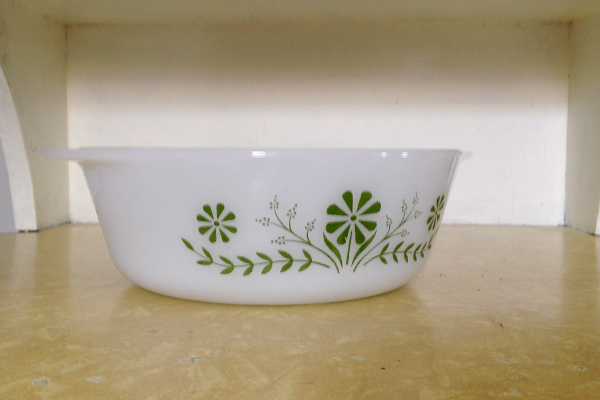 I think I might start collecting pyrex and dishes after seeing all the awesome things out there! And now, I think I might have to check out the mug swap! I only collect the ones I can find for super cheap. I think they're making a come back because the prices at the flea market have been on a steady rise :( oh well, it's great when you find a deal!! And do, check out the mug swap! I do love that dish! I'm so looking forward to getting my email for the swap. Excited!! Hooray for old stuff. It's the best. can't wait for the mug swap. one of my fave's too. I think shopping is the most fun for me. Yay for the mug swap too! Thanks! It was so fun! Thanks for visiting!! um i love you. and also, i have a romper here i keep meaning to send you. Bwaah-haaa-hah. I laugh a little every time I put one on P. No joke. Im so glad you liked your goodies! I LOVED mine and yes I will definitely be posting pictures :) I just got back from BlogHer and am waaaay behind on blogging but I will let you know when my post is up about your fabulous finds for me! They were so very thoughtful!! Thanks again. Hope you had a great time at the conference! Whenever you find a swap, sign me up! I love shopping for others. And who doesn't love receiving a thoughtful gift every once in awhile. I am signed up for the mug swap. Thanks!